Most of the Yankees’ plans for next season are up in the air, as team brass hasn’t even sat down yet to map out a strategy for 2019. 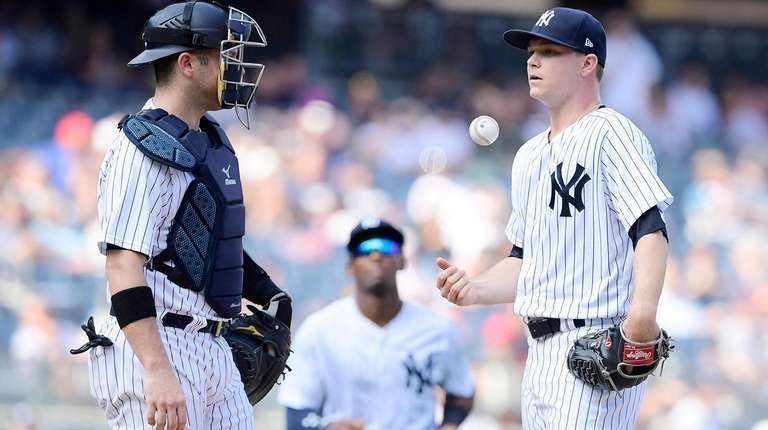 But one personnel move is not in doubt: Brian Cashman is ready to ship out Sonny Gray. The Yankees have only two starters under contract for next season in Luis Severino and Masahiro Tanaka. Gray, 28, was a top starting pitcher with the A’s, but he has proved to his bosses’ satisfaction that he cannot succeed in New York. Gray was removed from the rotation and finished the season 11-9 with a 4.90 ERA in 30 games (23 starts). He was not on the postseason roster for either round. In the immediate aftermath of the last game of the season on Tuesday, Gray was asked what he hopes will happen in the offseason. Boone said Voit is the early favorite for first base. Voit, 27, hit .333 with 14 homers and 33 RBIs in 39 games after the Yankees acquired him from St. Louis in a little-noticed July trade. Cashman said he has “no regrets” about trading for Stanton even though last year’s NL MVP struggled in the postseason. The Yankees are not giving up on Sanchez, who hit .186 in an injury-filled season and led the major leagues in passed balls with 18 in only 76 games behind the plate. Andujar had a phenomenal rookie season at the plate but was so shaky in the field that Boone replaced him for defense early in postseason games twice and benched him for ALDS Game 4. The Yankees have to decide on a $12.5-million option or $2- million buyout for Gardner. Sabathia will be a free agent. Cashman said he expects all of Boone’s coaches to return in 2019.